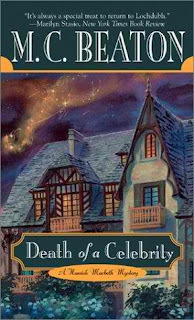 Death of a Celebrity is the eighteenth book in Beaton's cozy mystery series featuring Constable Hamish MacBeth. This time, a beautiful yet slutty news reporter named Crystal French is the victim. Crystal has always tried sleeping her way to the top with no luck, until she catches her lucky break as the eyes and ears behind scandal in the sleepy town of Lochdubh. To maintain the high ratings for her show, the catty Crystal drudges up old news and rumors on the village's inhabitants, which brews up new feelings of hate for Crystal. When Crystal's body is discovered and the signs point to foul play, our trusty Hamish MacBeth starts nosing around to reveal the true murderer. As with all the other books in this series, Death of a Celebrity is an amusing, fun, quick read for a lazy afternoon. The plot's formula is consistent; village newbie/outcast is found dead, Hamish employs the help of an attractive woman to aid in the investigation although he is ever smitten over Priscilla Halburton-Smythe, and finally, Hamish solves the crime only to allow another officer to take the credit so Hamish can live peacefully and lazily in his humble Lochdubh abode. Hamish's musings at the rudeness and inhospitality of his fellow villagers is always entertaining, especially since by now, all of us readers are incredibly familiar with the cast of characters. Death of a Celebrity introduces us to Detective Chief Inspector Carson, who has temporarily stepped in for Inspector Blair; slightly opening up the ongoing storyline regarding Hamish's reputation and clever investigating skills. Despite being constantly talked down to by the other officers in his division, Hamish's kindness once again shines bright and true when he welcomes Carson into his home. The dated lifestyles of the Lochdubh people is always comical -- it's like they're all stuck in an alternate universe or time-warp in which internet exists but cell phones do not. For example, one of the main clues in this novel are hairpins, where there is some confusion behind missing hairpins since the victim was wearing her hair up. According to the dialogue, it appears all Lochdubh women use hairpins to wear their hair up. Is there no such thing as rubber bands or even scrunchies, for godsakes?! It's not like the book occurs during wartime. Also, why is wearing brown hairpins in blond hair suspicious? Do the Scottish not like to wear contrasting colors? Curiouser and curiouser, indeed. Death of a Celebrity is followed by #19 -- Death of a Village (2003), #20 -- Death of a Poison Pen (2004) and #21 -- Death of a Bore (2005).